Hi Text/Isle – Thanks for sharing the baby quilt. Great way of using leftover pieces. Your baby quilt is really pretty! 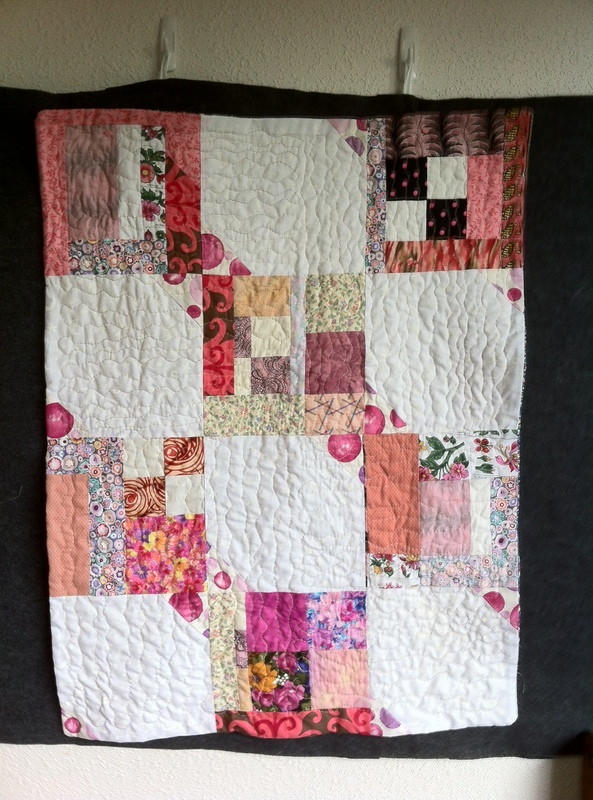 Thanks so much for stopping by my blog to comment on my scrappy quilt as well! Since wordpressers show up as no-reply to us blogger users (I hate that), I wanted to pop over and thank you “in person.” To answer your question, my improv blocks were 12 inches finished. And thanks for the info’ about the block size. 12 inches finished sounds good. 15 inches for Southern Alberta flood relief was a big large, and 9 inches can be a bit confining. I haven’t been ignoring you or anyone else and will get around to approving all the comments from quilters. My Firefox browser froze and on Chrome it was impossible to reset my password. I just got back in now through Internet Explorer. So frustrating because my traffic was up and I kept seeing emails that folks were making comments. I know my traffic was up because yesterday I actually had ads on my blog for the first time ever, but today they’re gone again. I had to look up who Cheryl was. I know the Amandajean half of the duo!! Slabs rock! I will have to check out the “slabs”, thanks for the link! This is darling!!! Thank you, Sarah! Will be visiting later in the day I hope! I like a low volume quilt that still has some volume. Very nice! The colours in your quilt are just so pretty!